Laurie-Ann was inspired by a series of prayers that were prayed over her and Tony in August 2017. They were preparing to leave for South Africa, and when the prayers involved a river, L-A heard an inspirational message in her heart of a 'rainbow becoming a river.' She attempted to draw it, and this is what came to mind. This drawing was purchased in Ottawa. Laurie-Ann was and is again inspired by the beautiful land in Western Cape. This is of our first guest house in Worcester, in the neighbourhood of Fairway Heights (it has a thatched roof and is called 19th Hole Golf Villa). Laurie-Ann was inspired by an impression she received when visiting the Worcester ministry Kibbutz El-Shammah, which is located in the Roodewal township. She gifted founder Erena van Deventer the drawing in late December. Laurie-Ann started this drawing in the Dwelling Place church in Richmond, Virginia. She was visiting her Iris family in that location and this evening a wonderful glory cloud filled the room. Pastor Brian Britton was engulfed by it, as was Laurie-Ann. She could feel a sweet mist of love all around her - and so drew this impression. The piece was finished in South Africa. ​This drawing is available unframed. If you are local to Western Cape, and are interested in acquiring it, please message her via the contact form (on the contact page). The cost is R1200 or USD $100. "Revelation Song​" was sketched during worship at the YWAM base, Worcester, Western Cape at the end of February, 2018. The worship team played for an hour, with many internationals and locals. L-A had an impression of a lamb on a throne, and began drawing from there. L-A included a girl who was worshipping in front of me, and the guitarist in the worship band. What was amazing, was L-A had most of the outlines sketched out just before the last song of the worship set, which was "Revelation Song." This isn't the first time that Laurie-Ann has drawn something before it happened (examples include songs and sermons). It just means we're all in tune with what the Holy Spirit wants to say. It was finished in June 2018, but will also be in line form in a prophetic colouring book that will be available as a resource. The children in our kids clubs, and our school love to colour these in. This drawing is available, and was exhibited framed at the Doxa Festival in Worcester October 13-14, 2018. It is framed with a white mat, blue inner lining and white frame. If you are local to Western Cape, and are interested in acquiring it, please message her via the contact form (on the contact page). It is R3200, and is in the coffee shop at LeRoux & Fourie Vignerons. The wine shop is on R60 between Worcester and Robertson, beside Cape Lime. "Jesus Makes all Things New" was drawn in Worcester Western Cape in August 2018. While L-A was in soaking prayer, she had an impression of enjoying in a meadow of spring flowers with Jesus. Much of the Western Cape has been in a drought and August - September is the spring flower season, especially on the Western coast. She paired a recent photograph she loved of Namibian desert with a recreation of an old drawing of Jesus with a little girl, added the spring flowers, and the drawing was born. 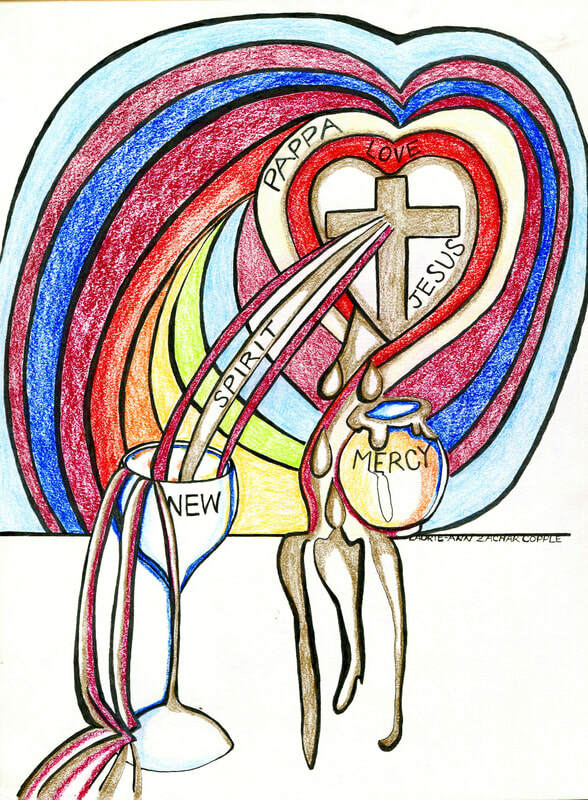 The drawing was specifically made for Worcester Christian Church's Doxa Festival in October 2018, which has the theme of "God's Glory." . We have some unframed reproductions of this drawing for R500, available direct from Laurie-Ann. She also has a version with just the black and white lines, which will be available in a future colouring book. Currently, these line drawings are used to minister to the kids clubs in which she and Tony and involved. This drawing is available! It is R3200 framed with a lovely white mat, green inner liner mat and white frame, and is in the coffee shop at LeRoux & Fourie Vignerons. The wine shop is on R60 between Worcester and Robertson, beside Cape Lime.